For some reason the National Hot Cross Buns Day is celebrated on September 11. 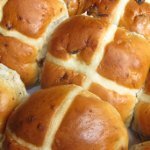 It is strange because hot cross buns are typically baked and served on Good Friday. Hot cross buns are spiced sweet buns made with raisins or currants. They are so named because they are marked with a cross on the top. Hot cross buns are surrounded by many superstitions in English folklore. For example, buns baked on Good Friday are believed to have healing properties. Sailors used to take hot cross buns on their voyages to protect themselves against shipwreck. People also used to believe that a hot cross bun hung in the kitchen could protect the house against fires. The handing bun needed to be replaced once a year. Hot cross buns are popular in English-speaking countries. Some countries have local variations of these pastry. For example, in the UK supermarkets offer apple-cinnamon, orange-cranberry, and toffee buns. In Australian and New Zealand, chocolate and coffee-flavored versions of the bun have become popular. It you like buns and don't want to wait until Easter to enjoy them, you should definitely celebrate the National Hot Cross Buns Day by baking a batch of buns and treating your family, friends, neighbors and coworkers.